The FIA Pre-College Portfolio Development Program (PDP) is a multi-semester course of study that provides serious high school artists with college-level studio arts instruction. 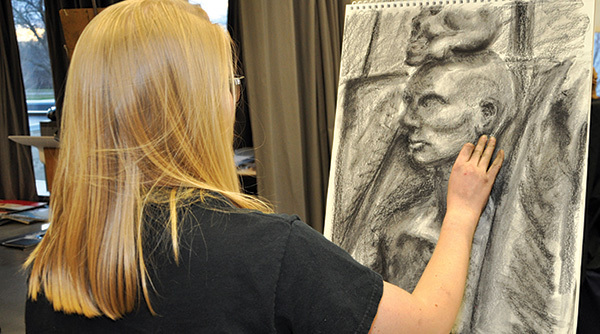 Visiting artists, presentations by college admissions representatives, and field trips to National Portfolio Day and prominent Michigan art schools expand the studio experience. In addition to rigorous training in drawing fundamentals, students take courses designed to expand the breadth of their skills, as well as helping them begin to develop a personal artistic vision. Courses include Painting, Ceramics, Welding, Printmaking, Glass, Illustration, and Photography. Students finish the program with a Capstone course, which covers final editing of their portfolios and the presentation and exhibition of their works in the Art School. Classes meet 2½ hours one evening each week for three ten-week sessions from September through May each year. Scholarship assistance, based on need, ensures the program remains merit-based. A limited number of full-tuition scholarships are available to students that reside in the city of Flint. 2019 Portfolio Development Program Application materials will be available in July 2019 and will be due in November 2019. Classes will begin in December. For more information call or email the Art School at 810-237-7315 or arted@flintarts.org.